The sun dances off the waters of Chequamegon Bay as a light wind ruffles the surface of the water. Oak Point stretches out in front of us. It is a line of dark green trees and rocks that have survived thousands of years, battered by the winds coming off Lake Superior. In the shallow water, are perhaps hundreds of old logs, washed up against the point. Those logs broke free of the log rafts that have floated across Lake Superior over the last hundred years in the days of the logging boom. Today they provide cover for the huge smallmouth bass cruising these waters. Although it’s calm today, you can see this land and water have endured great storms and wild weather. Only the toughest live here and smallmouth bass are one of the toughest fish in these waters. Doug Hurd of Eagan, Minnesota, and I are here in search of the great smallmouth bass. It is a warm mid-June morning. Doug is slowly motoring through the water with his eyes on the depth finder. “There is a rocky ledge right in front of us,” he tells me. “The water drops into about 5 to 7 feet of water right off the ledge and I think this might be the best spot.” Doug pulls back on the throttle to shut off the motor, stopping us about twenty feet from the edge of the shallow water rocks. We are fishing wacky worms rigged Texas style. We cast into the edge, letting our plastic worms drop into deeper water. Within the first half dozen casts Doug pulls back, setting the hook as his rod tip plunges. A fish swirls on the top of the water before it dives and charges off. “It’s a good fish,” Doug says as I quickly reel in my line, dropping the rod on the floor of the boat to grab the net. The fish makes a couple of runs by the time Doug gets it close to the boat. As I extend the net, the fish keeps darting off. Smallmouth bass are tough fish. There is no give up in them. Finally, I get the net under the fish and pull up. The fish is twisting and turning in the net as I bring it in the boat. 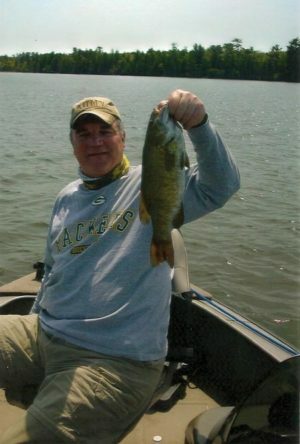 The fish is a thick, muscular seventeen inch smallmouth bass. We take a quick photo before Doug slips it back into the water. “What a pig,” Doug says as the fish bolts off. A few minutes later Doug connects on another fish. It is about fifteen inches long. It puts up a strong, tenacious battle; never giving up. On the next cast, just after Doug releases his fish, I feel my line shooting out. I pull back on my spinning rod, out of instinct. There probably is no reason for me to set the hook as the fish is on solid. I see my line slicing through the water as the fish is racing for the surface. I am cranking furiously on my reel to get in the slack before the fish gets to the surface. I don’t make it. The fish vaults out of the water, clearing the surface by about 2 feet before it splashes back in the water. I am lucky. The hook held and I still have the fish on. My drag is clicking as it is letting out line. Doug is now standing at the side of the boat with the net as my fish continues to race off. I turn it but the fish still doesn’t give up and races off again. My spinning rod is bent in half. I start getting the fish closer, but like all smallies it doesn’t give up; even when I finally get the fish close enough for Doug to net it. When I press the fish against the measuring tape on the side of the boat, the fish measures seventeen inches. “This is what we came for,” Doug exclaims as I release the fish and he and I exchange high fives. We continue to work along the ledge and within an hour we catch 9 smallmouth bass measuring from fourteen to nineteen inches. The sun is higher now in a cloudless, pale blue sky when the fish stop hitting. We move into shallow water and try again without getting a strike. We try deeper water and again, get nothing. We look around us, seeing a rocky windswept point jutting out into the water, separating Chequamegon Bay from Lake Superior. At the tip of the point is a lighthouse, standing as a lone sentinel against the waves and winds that tear at it. We motor over. A rocky point with deeper water nearby should be a magnet for fish. Doug and I work it hard but do not get a strike. For the rest of the day we hunt smallies but do not find them. Finally, we head for the landing. We have a broasted chicken dinner at a little restaurant in Ashland and are now back in our motel room talking and planning strategy. Out of the window in our room we see the sun sinking into Lake Superior to the west. Doug and I have been coming to Ashland and Chequamegon Bay early in the season for several years. We have been coming here because of our obsession for smallmouth bass. They are probably, pound for pound, the toughest fighting fish in fresh water. In the early season, these smallies are in Chequamegon Bay in astounding numbers. We normally catch fifty or so fish a day. There are also lots of big fish. One year Doug and I both caught our personal best smallmouth bass of twenty one inches within an hour of each other. But this year we are stumped. We fished all the same places we caught fish in other years. We caught only 9 fish and except for one hour never had another strike. What has changed? “I think we came too late this year,” I suggest. Doug agrees with me. Normally, we fish here mid to end of May. Even in nasty weather the smallies are hitting during that time of the season. This year is different. 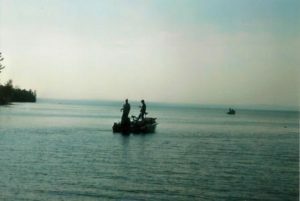 Due to scheduling conflicts, we ended up in Chequamegon Bay in mid-June. As well, summer came early this year and temperatures are considerably warmer than expected. Doug and I fished all day in short sleeves. Normally, we have several more layers of clothing on. “We are probably a couple of weeks late,” Doug added. “I was just thinking about that too,” Doug adds. Shell Lake is about an hour and a half drive south of Ashland. In fact, we drove right by it on our way to Chequamegon Bay. But most importantly, Shell Lake has smallmouth bass in it. When you are obsessed with fishing for smallies it seems like a good alternative, especially when the first spot is not working out. Doug and I are obsessed with fishing for smallmouth bass. We have been chasing them for years. For us they are hard fighting fishing, tough and tenacious. Adding to their mystic is that you don’t find them all over. For the most part you find them in lakes in the northern third of Wisconsin or in rivers. It is a magnetic combination that fuels a magnificent obsession. Doug and I have fished Shell Lake for a lot longer then we have been coming to Chequamegon. It was one of our first smallmouth bass haunts and we make several trips a year to it. Admittedly, the smallies there are not as big as the ones in Cheguamegon Bay but regardless of size, smallmouth bass are always fun to catch. “Let’s do it,” Doug said. We walk over to the motel office to tell the folks there we are checking out the next morning and want an early wake up call. The next morning we stopped at one of our favorite cafes in Spooner, had country fried steak and eggs with a pile of hash browns and by late morning are motoring across Shell Lake. The sun is bright, the sky is light blue with a ribbon of thin white clouds and there is only a little wind to ripple the clear water. On Shell Lake I switch from a sinking worm to a tube jig. For years I have used only tube jigs when I fish Shell Lake. We are fishing a rocky point and I feel my jig bounce off the rocks on bottom. Suddenly I feel weight. Dropping the rod tip, I reel up the slack and pull up the rod tip. I still feel weight and now a slight thumping so I pull back hard to set the hook. My spinning rod is bouncing as the fish is racing off and then for the surface as I am trying to get the slack out of the line but the fish flips out of the water, throwing the hook. I always hate to lose the first fish of the day. It seems like a bad omen. I think I said some unkind words. Half a dozen casts later I again feel weight. The fish in one built solidly and after a brief, hard fought fight I lead the fish into the net. It is a foot long smallmouth bass. It is good start to the day and I have shaken off the effect of losing the first fish of the day. From there, Doug and I work along the shoreline. We skip tube jigs under and around docks and catch smallies. We expected that with the docks providing shade and cover on a bright sunny day. What we didn’t expect was picking up fish between the docks where the fish are in the open in clear water on a sunny day. The water in Shell Lake is amazingly clear which is what makes it such a special lake. Even in mid-summer when other lakes are discolored from summer weed bloom, Shell Lake is always clear. There have been times we have been sitting in 10 to 12 feet of water and can see the bottom. In the clear water I have seen schools of smallmouth bass and when I cast to them I am often rewarded by seeing a fish move towards my bait. Today the fish appeared to be in the shallows and might be in their post spawn patterns. Sometimes, however, we move into deeper water and still find fish. It seems wherever we go we find fish. Most of our fish are smallies but occasionally one of us picks up a largemouth bass. I am not sure if this is a good sign or not. 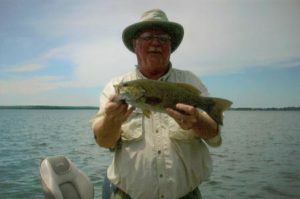 I have heard that once largemouth bass become established in smallmouth lakes they take over and push out the smallies. I would hate to see that happen in Shell Lake since it is has such good smallmouth bass fishing. Where else would Doug and I go to indulge our smallmouth bass obsession? We are now in a spot where the shallow sandy bottom drops off into deeper water. Although it is some distance from the bank, there are several boat lifts here. The owners of these boats either have long docks to get out this far or they need to wade out to get to their boats. Doug flips his bait to one side of a lift and I flip my bait to the other side. “Got one,” Doug says. I look over toward Doug and I see his spinning rod bent in half. I feel a tick on my line and then a couple more. I strike back as an instant reaction without looking at my line. I feel a fish surge off. I got one too,” I yell as I am trying to turn the fish. The fish stops and I start getting it coming toward the boat when it takes off again: Another typical fight from a smallie. The fish dove, flew out of the water and took off again. Finally, I had it next to the boat. And reaching over I grab my fish, I pull it in the boat. I look over at Doug and he is also holding his fish. Both fish look to be over a foot in length. “A double,” he says as he holds up his other hand for a high five. “Can’t ask for more,” I reply as we exchange high fives. It is late in the afternoon. We are hot and sweaty and caught a bunch of smallmouth bass. Our biggest was about sixteen inches, which would have been considered an average fish in Cheguamegon Bay, but it doesn’t matter. What started out slow in one place but ended well in another. Plus, we caught a bunch smallies. What a magnificent obsession.